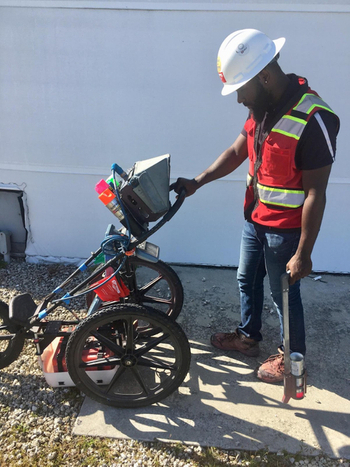 Ground Penetrating Radar Systems was recently contracted to complete a site investigation prior to major renovation and construction at a local Miami mall. The mall was going to be staying open through all phases of the project and delays due to utility damages or other line-strike issues were a major cause of concern for both the Mall Owners and the General Contractors on site. 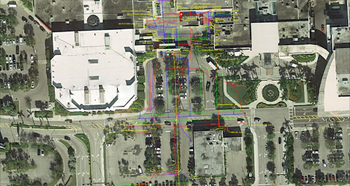 GPRS was tasked with not only locating and painting all the utilities including post-tension cables, conduits, rebar, and voids found on site, but also documenting the location of each utility with as much accuracy as possible. The technologies used on this project included the standard locating equipment (400 MHz antenna and EM locator), but also included a Geode (GPS collection device) and a Drone to create an orthomosaic map of the areas scanned. 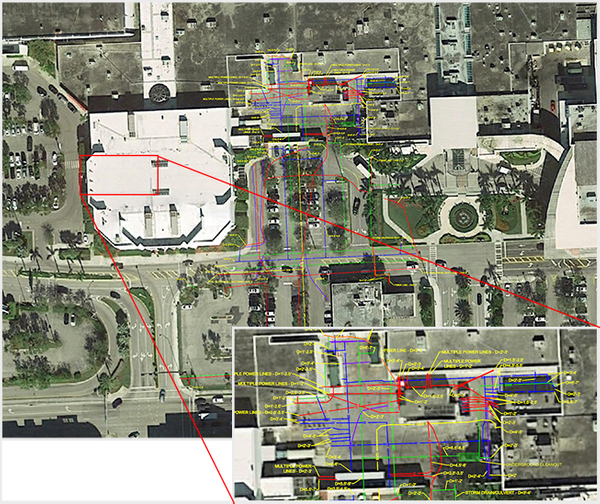 During the investigation, the Miami, Florida based Project Manager located a large amount of utilities on site, ranging from gas, water, sanitary sewer, storm, electrical (primary and secondary), and communication to several unknown utilities. Each item, after being located by ground penetrating radar, was then given a depth and painted out in its corresponding color based on the uniform color code outlined by 811. 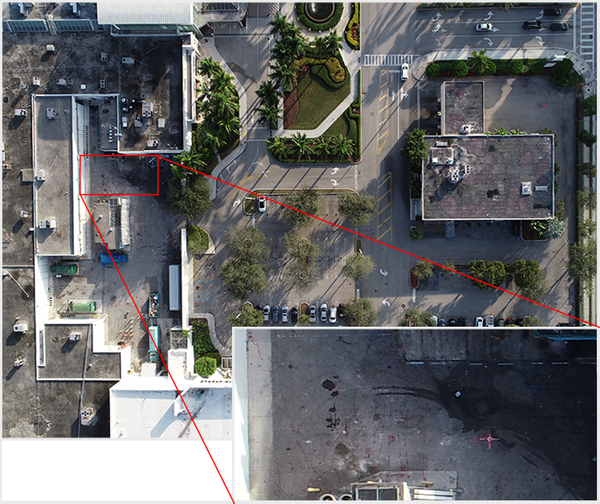 The image to the right is an aerial shot taken by the drone at an approximate height of 500 foot. The height here is too high to depict the markings from GPRS, but once zoomed in the markings become clear. The high resolution of the photographic map allows the zoom feature to still depict the paint markings on the ground. The callout box shows the detail collected from the drone scans. In addition to the drone mapping, GPRS also layered findings into a Auto CAD drawing for the client. All lines were collected with a Geode GPS, that data was then compiled into one file and placed into a drawing. The snapshot to the right is the result of the scans and GPS data collection. Each line is color coordinated based on utility type and includes the depth of the utility. Following the utility locate, CAD report and drone scan the client was able to effectively understand what utilities were within the project area. Due to the fact much of the project area would include building a new wing to the mall, many of the existing utilities needed to be rerouted. Utilizing the CAD file, the general contractor was able to plan new routes and utility demolition accordingly to accommodate the new building space and renovations. In the image on the right, you can see a GPRS project manager using his 400 Mhz Ground Penetrating Radar antenna. He was able to coordinate the scanning and data collection for all services and manage the project through completion. If you would like a similar project completed or want to learn more about the technologies that GPRS uses on its projects, reach out to your local GPRS representative by visiting our contact us page.